Can China's Comac ever challenge the Airbus-Boeing duopoly? The Commercial Aircraft Corporation of China (Comac) may be emerging as the next biggest threat to Airbus and Boeing. The two big airplane manufacturers are in the process of neutralizing the biggest threats to their dominance in the industry. Airbus purchased the 108 to 133-seater CSeries from Canadian manufacturer Bombardier, while Boeing is in talks to buy 80% of Brazilian manufacturer Embraer. It is reported that investors overestimated the challenge from Bombardier and Embraer, but they are now underestimating the challenge from Comac, which is run by the Chinese government. With a push from the government, Bombardier and Embraer could have become serious contenders, and this is exactly what China is trying to do. 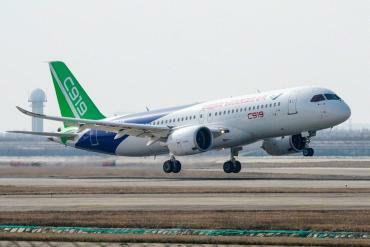 Called the C919, Comac's rival to the Boeing 737 and the Airbus A320 took flight for the first time last year. It is estimated that around US$ 7 million of public money has been spent on the single-aisle plane, and that around 1,000 bookings have already been received for the plane from Chinese operators. Comac is also expected to come out with bigger twin-aisle planes that have more range and seat more people. These could fly from Beijing to New York. It is reported that they are developing turboprops, business jets, helicopters and seaplanes. They are also reported to be building a training center for maintenance engineers, flight attendants, and other airline employees. With more money and a push from the Chinese government, Comac could soon be going head-on against Airbus and Boeing. The company claims that over the next 2 decades, around 9,000 planes worth around US$ 1.3 trillion could be delivered in China.